Did the title of today’s blog make you stop to look into the nuts and bolts of it. If you speak Italian, you’re already familiar with the meaning of the word, but still have no idea what it has to do with a winemakers almost coherent ramblings. It is the name of one of our new wine additions, and the music is Swing Fever.You can check them both out on June 2nd. Please check out the details on Swing Fever on our events calendar. So, back to this wine name. Honestly,Trish is the only one who knows why she chose this name,and I’ve been told the secret has been hermetically sealed in a wine bottle with baling wire and duct tape signed by Red Green.What I can tell you is Magari, depending on how it’s used can mean: maybe, perhaps, possibly, as well as a few others. 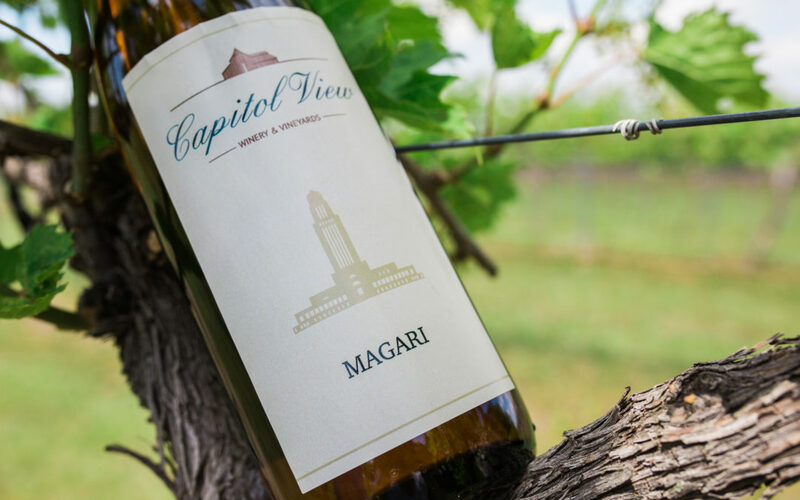 That being said; maybe we could have another glass of Magari, perhaps while sitting on the beautiful new cedar deck overlooking the vineyard, and just possibly, have one of the best times this spring has to offer. I know, shameless plug for one word–but a versatile word, and a versatile wine. Magari is a blend of ninety percent LaCrosse, and ten percent Frontenac Gris. We’ll talk about the Frontenac family at a later date,but for now we’ll concentrate on LaCrosse. LaCrosse is probably the main reason I was able to get started in the wine business. Back in the late seventies and early eighties there just wasn’t much that could be grown in this climate. Frontenac wasn’t around yet, and actually nothing else from the University of Minnesota grape breeding program, such as Marquette. The French Hybrids that I tested only gave two grapes that were somewhat reliable, and they were Marechal Foch, and deChaunac. That brings me to the man that made it possible for me: Elmer Swenson. Elmer was a grape breeder from Osceola Wisconsin, and bred mostly for table quality. You would recognize a plethora of the grapes that he’s put into the hands of growers in this part of the world, but many are being used all around the globe. We’ll get into Elmer’s work a little more at one of the winemaker dinners, and just concentrate a little on LaCrosse here. One of this grapes parents is a well known French Hybrid named Seyval. At this point in time Seyval is the grape that gets us as close to the flavor profile of Chardonnay as we can, in this part of the country.The only problem with Seyval is that it’s only hardy in a few areas of the state, and won’t take the worst of our winters. The good part of this story is that LaCrosse has picked up quite a bit of this flavor profile in it’s heritage, and it’s significantly more cold hardy and disease resistant.This profile is evident when LaCrosse is picked when fully ripe, but when picked earlier at lower sugar levels it can bear some resemblance to a Riesling, and that’s where we were heading with this wine. Magari is just off-dry with crisp acidity and low alcohol. the perfect thing on a warm day when you need something lighter, but very food friendly. For my taste, dry cheeses, hard salami and a crusty sourdough; your taste buds, you choose. By the way, if you happen to be around when the LaCrosse is blooming–which should be any day–the flowers smell like black pepper. Don’t forget to check out the calendar, and also the gorgeous new cedar deck overlooking the vineyards. If there are Italian speakers out there give us you’re examples of Magari usage. Oh,and if you’re of the mind to, and want to impress someone, go ahead and roll your r’s when you order that Magari.